Well, we’re not sure if Hanumanth is going to get votes against his competitors – but he’s surely won some jolly laughs from people everywhere! An energetic man in a white shirt, black pants, and glasses, holding a sheaf of papers, walks along with an entourage of people shouting slogans. Among them is a young man holding a box. The group enters a house where two amused women are standing. The group leader approaches the first woman, and gives her a sheet of paper – and soon after, he gives her a solitary slipper from the box, as she giggles. “Hit me with it if I fail to deliver my promises,” he tells the woman as she laughs, but the man goes on to pick up another slipper and gives it to the other woman in the room, who cannot control her laughter. This is Akula Hanumanth, an independent candidate contesting the Telangana elections from Korutla constituency of Jagtial district. 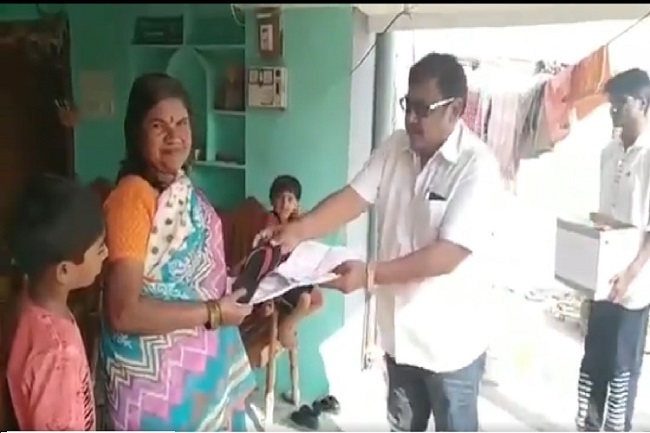 And while campaigning for the elections, Hanumanth has decided to show his sincerity by distributing slippers to constituents, in the hope that they will vote for him. 'Hit me if I don’t deliver,' is his message as he campaigns in Mettupalli town. Hanumanth has also been handing out his undated resignation letter to the voters, pointing out that “people have the power” to remove him from the post of MLA if he does not do his job right. Speaking to TNM, Hanumanth says he has not studied beyond the seventh grade but wants to improve the quality of life at Korutla constituency. “I have been thinking about contesting elections for a long time. Around twenty years ago, I once even contested in the ward elections, but this will be my first attempt during state Assembly elections,” he says. The 45-year-old has decided to contest the polls as he felt there was no improvement in the quality of life in Korutla. “People come to power and don't do any work and this cycle repeats. There is no way to hold the people we elect accountable. I decided to give the voters slippers and an undated resignation letter as it's my way of telling them that I can be held accountable,” he added. Hanumanth says he is an agriculturist who is into real estate and is promising his voters that he would focus on getting funds for his constituency if voted to power. “I will ensure that the funds get released for the constituency for roads, improvement of schools and ensure more transparency in the revenue department,” he adds. Ever since Hanumanth‘s campaign video went viral on social media, Hanumanth says people have been reaching out to extend support to his campaign. “The locals are extending their support to me, they say I am doing something different and they like my efforts. I am even getting calls from Hyderabad-based college students who are willing to help me fight the elections; people working in private firms are also calling me. These are common people coming forward to help,” says Hanumanth.